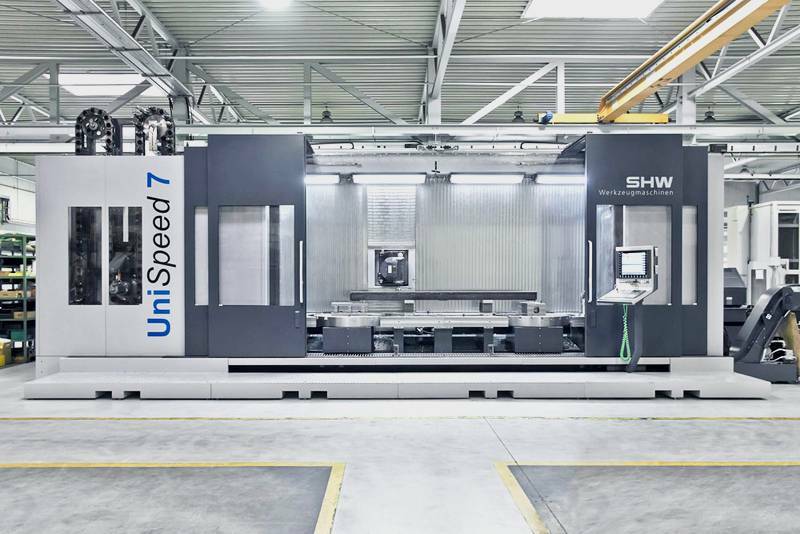 Maschinenfabrik Albert presents new UniSpeed 7 from SHW Werkzeugmaschinen which provides increased productivity and flexibility in machining of large parts. This also benefits customers including one of the world’s most renowned ballet companies. “First-class machinery is essential for the manufacture of our customer and application specific screw jacks”, emphasises Martin Kirchmaier, CEO of Maschinenfabrik GmbH Albert, which belongs to the Inkoma Group. 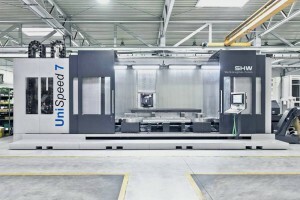 “The new UniSpeed 7 from SHW Werkzeugmaschinen has advanced us enormously in the machining of large parts”. It is not just the technical characteristics and pendulum machining that have impressed the Austrians but especially the fact that the machine is very rigid and free from vibration and is completely enclosed. This is of particular advantage to the manufacturer of safety-related gear units when it comes to moving the boards that capture the interest of the world. The new UniSpeed 7 has been designed from the start as a basic machine for large parts. Therefore large workpieces up to six metres in length can be machined quickly and precisely. The newly designed machine bed ensures even quieter and more stable operation. It is made in a single piece and filled with polymer concrete. This makes the machine extremely rigid and effectively suppresses vibrations. The single step to the mounting surface and an automatically opening operator door are part of an improved ergonomics concept making it easier for the operator to access. The spindle transmits a very high torque of 900 Nm. “Compared with machines of a similar order of magnitude it is almost unique,” says Martin Rathgeb, Technical Director and Company Secretary of SHW Werkzeugmaschinen GmbH. The workspace extends to 6000 mm in the X-axis, to 1600 mm in the Y-axis and to 1300 mm in the Z-axis. However, the machine does not necessarily need a contour foundation. In addition, the resourceful designers of SHW Werkzeugmaschinen have optimized the chip flow. A machining area extraction unit extracts the vapours and spray mist from the machining area and provides not only healthier working conditions but also improved visibility into the machining area. “Above all, we were impressed by the cleanliness inside and around the machine and the ergonomic access with just one step,” noted Kirchmaier. At Albert the machine is equipped with two integrated rotary tables for pendulum operation with parallel runtime setup option. On the one hand this increases the working range within the still relatively compact dimensions of the machine. This enables the whole of the machining area to be fully utilised for longer parts. And on the other hand it allows the option of partitioning through a divider for parallel runtime setup, with the greatest savings in time. As Rathgeb comments, “It makes for great productivity gains in daily operations”. The machine has an automatic tool changer and a pick-up station for tools. The novel orthogonally designed SHW universal milling head picks-up and changes them automatically in an instant. 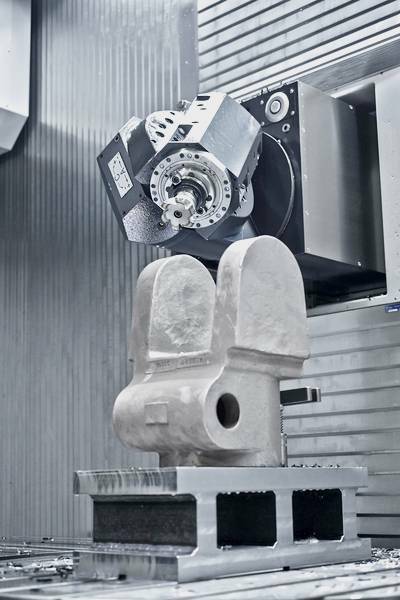 The compact and powerful orthogonal milling head has been the core of SHW machine tools for over 50 years and due to its agility it can approach the workpiece quickly and precisely from more than a calculated 216,000 positions. As a result of the 180° A-axis rotation and the 360° continuous variable C-axis, as employed on models with the head changing system, the compact head swivels fully automatically in any desired position. The UniSpeed 7 is the first SHW machine with the new Siemens 840D SL (Solution Line) control. 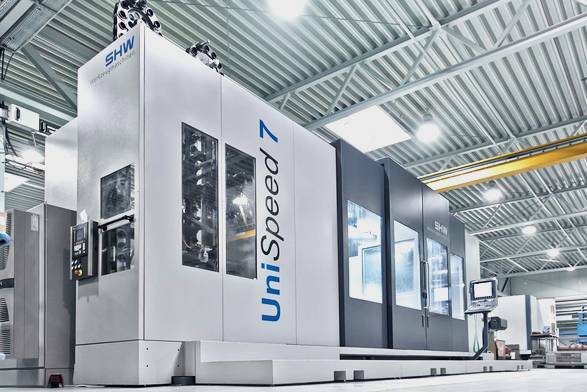 As Christian Hühn, managing partner of SHW-Werkzeugmaschinen, emphasises: “Even in the entry-level version, the new UniSpeed 7 is a highly efficient machine for processing large parts at an attractive price”. 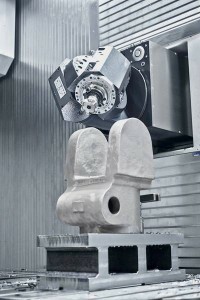 Overall, the concept offers high flexibility and efficiency in machining. 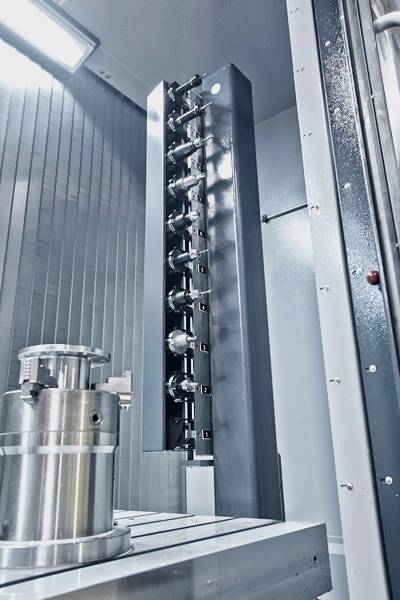 This is also confirmed by Kirchmaier, who is particularly impressed by the 5-sided machining in one setup and the high dynamics of the liquid-cooled drives on all axes. This is therefore how machined workpieces, which subsequently become high quality, distinctive screw jacks, are produced to the required precision at Albert. In the basic version of a SGT screw jack for example, the screw mechanism, swivel bracket and housing as well as the motor flange, spindle ends and other components must be precisely manufactured for extended durability and trouble-free operation. For the travelling nut versions, the swivel housing as well as the running and safety nut are also added. Albert screw jacks are available with manual, hydraulic, pneumatic and electronic drives, with spindle lengths up to ten meters, lifting capacities up to 2000 kN and lifting speeds up to 0.05 m/s. In addition however, dependent on customer requirements and application conditions, the Austrian company manufactures products with higher lifting speeds and from special materials for increased mechanical and chemical demands as well as with ball or acme screw threads. The ability of Albert products to meet these qualitatively high demands has already been proven in numerous applications. This also includes safe operation at ambient temperatures from -50°C to 200°C. Radio telescope antennae with great weight and expensive precision mirrors, costing tens of millions of Euros, therefore move reliably and with pin-point accuracy in ice and snow as well as in hot weather. In the paper industry they stand up to extremely tough and sticky raw materials. Here 150 synchronously operated gear units adjust the lips that determine the paper thickness. When an oil rig in the North Sea was being cut under water for sending to scrap, Albert screw jacks prevented the upward buoyancy from forcing the oil rig up like a champagne cork. Instead, the buoyancy was controlled and the platform could be safely towed ashore.